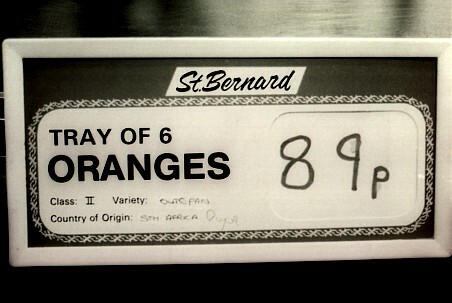 On July 19th, 1984, Dunnes Stores worker Mary Manning refused to check out a customer’s South African fruit (Outspan). Her union, IDATU (the Irish Distributive & Administrative Union), had directed their members not to handle goods from South Africa. She was given five minutes to change her mind and when she refused, she was suspended on the spot. 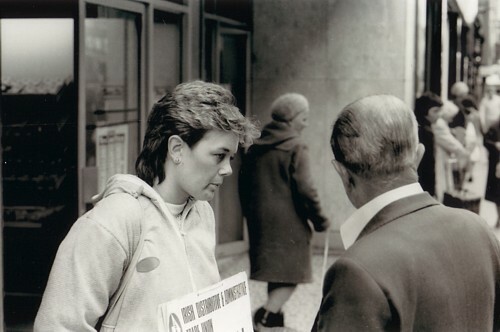 The 1980s were also a time of high unemployment making strike action a difficult decision for the workers. This selfless action by Irish workers in 1984 led to extraordinary events as support for their actions grew despite fierce racist reaction by some individuals. 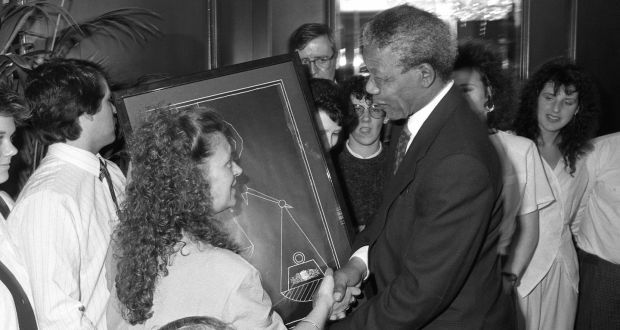 Karen Gearon and Mary Manning were invited to meet Desmond Tutu in London and Gearon testified in front of the United Nations Special Committee Against Apartheid. Then things really hotted up when the girls were invited by Tutu to visit South Africa. 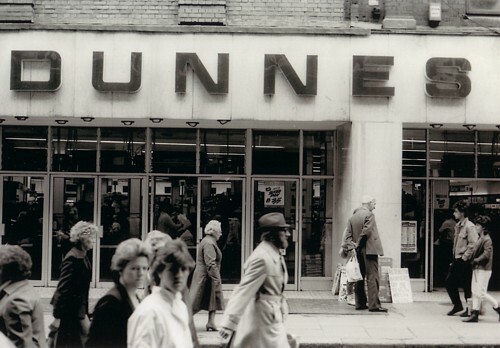 At the time, myself and many others would join the strike on Saturdays, the busiest day of the week for Dunne’s Stores. I was in my last year in art college and decided to base one of my final show prints on the strike. 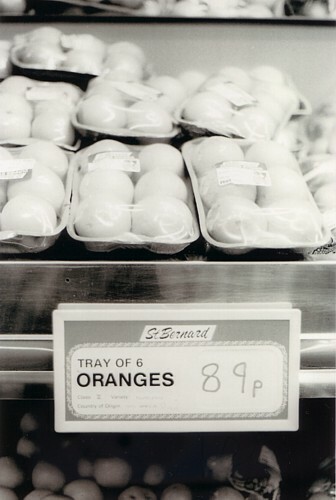 While taking photos of the offending oranges and grapefruit I was stopped by the management who threatened to take my film on the basis that I was ‘stealing their display designs’. The finished print can be seen below. 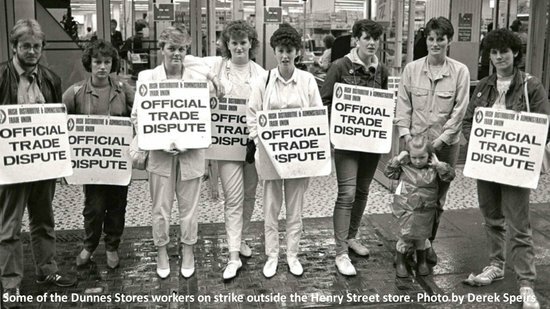 The strike would last nearly 3 years before the Irish government banned South African goods from being sold in Ireland. 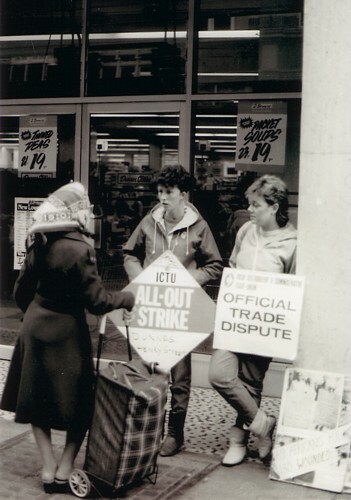 Their story entered the popular imagination as the Dunnes Stores strikers had songs written about them by Christy Moore (‘Dunnes Stores’) and Ewan MacColl (‘Ten Young Women and One Young Man’). 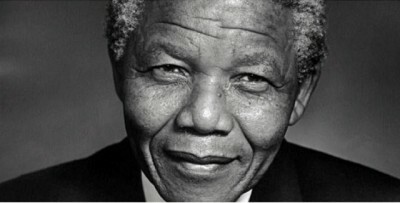 Several months after being freed from prison in February 1990, Nelson Mandela met with some of the strikers when he visited Dublin and told them that their stand helped keep him going during his imprisonment. In 2008 the workers strike action was commemorated with an official plaque in central Dublin. Caoimhghin Ó Croidheáin (@cocroidheain) is a prominent Irish artist who has exhibited widely around Ireland. 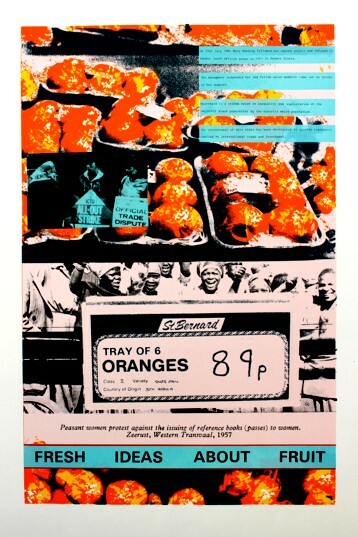 His work consists of paintings based on cityscapes of Dublin, Irish history and geopolitical themes (http://gaelart.net/). His blog of critical writing based on cinema, art and politics along with research on a database of Realist and Social Realist art from around the world can be viewed country by country at http://gaelart.blogspot.ie/.